Egypt's national football team boss Javier Aguirre said on Tuesday that striker Marwan Mohsen was one of the team’s best players in the 2018 World Cup and that he is currently the best forward in Egypt. “I didn’t know I would be Egypt's coach back during the 2018 World Cup, but I saw an outstanding performance from Marwan and he was one of the team’s best players,” Aguirre told an Egyptian TV station. Aguirre’s statement on Marwan came amid criticism directed at the 29-year-old striker by Ahly and Egypt fans over his recent performances. 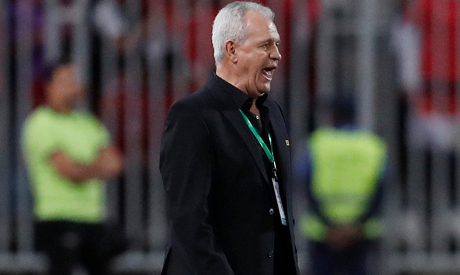 Under former coach Hector Cuper, Egypt reached the 2018 World Cup for the first time since 1990, but was eliminated from the first round after three back to back losses to Uruguay, Russia and Saudi Arabia. The Mexican manager stressed that the technical staff of the national team is currently focusing on the 2019 African Cup of Nations in Cameroon and that it is too early for any talk about the 2022 World Cup. “My target at the moment is to build a team that can compete in the African Cup of Nations and qualify for the World Cup. I work in an organised way and I think separately about every step,” Aguirre said. Egypt have already booked a place in the 2019 African Cup of Nations as they now sit in second place with 12 points in Group J of the qualifiers after rivals Tunisia (12), but the latter are favoured to finish on top, given their better head-to-head record virtue of the away goals they scored against the Pharaohs. Aguirre fielded Salah in three out of four games since his appointment as Egypt coach, where he scored four goals against Niger, eSwatini and Tunisia. Meanwhile, Aguirre said that Huddersfield Town’s winger Ramadan Sobhi is not being called to the national team due to his last injury and lack of participation with his club. “I advise Ramadan to look for a team where he can get more playing time,” Aguirre told the TV programme. Aguirre also revealed that players’ age is not an important factor when selecting for the national team. However, he is more inclined to younger players. “I didn’t know anything about Baher El-Mohamadi before coming to Egypt, but when I saw him for the first time with Ismaily, I realised he would have an important role with the team,” Aguirre said. “Salah Mohsen is a young but experienced player. If you bring an agent from Europe and ask him to guess Mohsen’s age, he would say he is 28, not 20,” Aguirre added.